DOKTOR KRANK: Th'Mole in Poland, Białystok @ Metro Club 16 May 2009!! Th'Mole in Poland, Białystok @ Metro Club 16 May 2009!! Oh, yeahhhhhh! Another wild and ultra-entertaining performance from Daly City Records artist in Poland! Barely a month after the devestating show by Mochipet in Warsaw. We've been really spoilt recently, ha ha ha! This time we will be rocked by a flamboyant and extravangant guy from USofA who knows how to be cool, namely Th'Mole (his track hit the top 1 chart on xlr8r in April!!). He will play at the regular Bady Movin night next Saturday, May 16th, 2009 in Metro Club in Białystok. Jonah Mociun (yes, his Polish-sounding name is not a coincidence, his family emigrated a few generations ago from Poland, thus he's very eager to visit the country of his ancestors) currently lives in California and has been active on the avant-gard electronic scene for years releasing music under numerous aliasses and playing alongside such artists as e.g. : Dj Krush, Venetian Snares or Meat Beat Manifesto. His live performances became legendary. I hope he will blow the house with a mix of weird hip hop and electronic soundz. 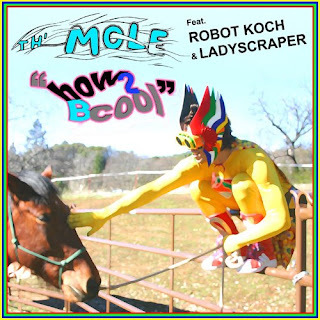 Chrome Kids in collaboration with Daly City Records has just released a second fre-release including remixes of the Th'Mole's prepostorous anthem How 2 Be Cool - by himself, Robot Koch and Ladyscraper. Grab it FOR FREE here. And finally listen to a special song prepared by Th'Mole for his Euro Trip - Dear Europe. Oh, yes! You are kindly welcome Dear Jonah in our house!